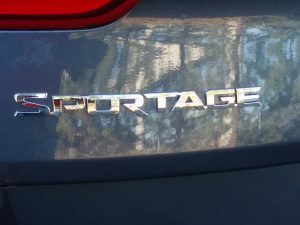 I was around when the Sportage was first launched into the marketplace as a somewhat cheap’n ‘heerful cute ute. 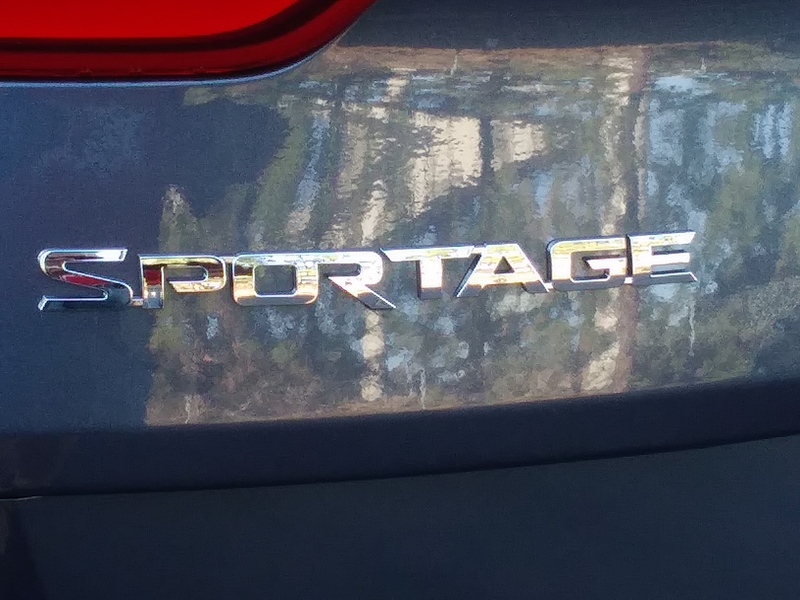 I’ll never forget KIA PR guy Geno Effler trying to educate us media members on how to pronounce the name of it, as most everyone wanted to say it “Sportaj” (like Taj Mahal) and he had to run around and tell everyone that, no, its more like Sport-edge or Sport-age. At first there was a compact ute convertible version, something of a cross between a Jeep Wrangler and a Suzuki Samurai. No matter — long ago and far away. 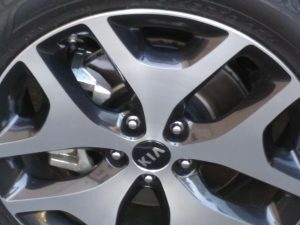 Since then, the Sportage has gone through several platform redesigns to become the handsome, smartly sized crossover SUV it is today. And feature content, quality and design have come a long long way since those humble beginnings too. My tester was top of the line SX turbo with AWD, and was jam-packed with luxury features, technology and connectivity that would please any buyer. 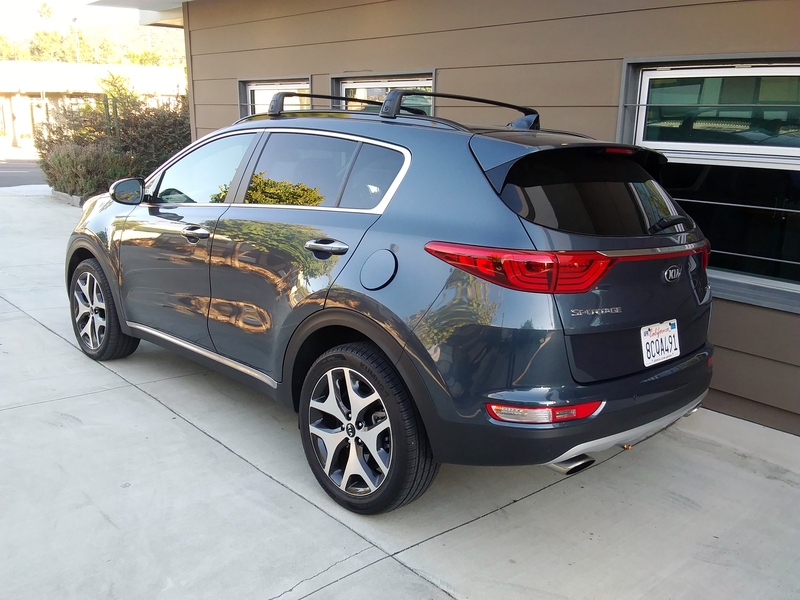 This handsome Pacific Blue metallic example was powered by the Hyundai-KIA group’s terrific 237 horsepower 2.0-liter turbocharged, gas direct injection four cylinder engine, backed by a crisp shifting 6-speed automatic transmission. 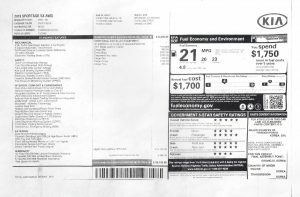 The EPA rates it at 10/23 city/highway MPG, with a combined overall rating of 21; which I found to be slightly conservative, and in spite of my heavy right foot, I was able to better these numbers with little effort. I find the Sportage’s packaging to be particularly handy; at 176.4 inches overall, it rides aboard a 105.1 inch wheelbase, which makes it “compact” without being small. There’s enough room between the wheels to allow five adults to fit comfortably within the two rows of seats, with a credible and useble cargo space aft, especially when you flatten the second row seatback. Overall the cabin’s design, function and quality is outstanding. The instrument panel and center stack puts everything front and center and easily readable or touchable to the driver. The gauges are clear clean and easy to read. 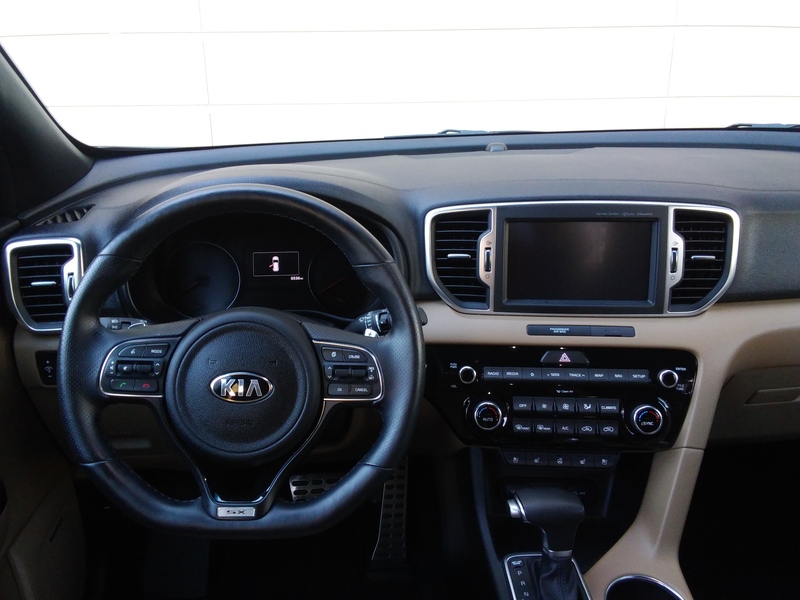 Naturally with my tester being a top of the line SX it came with a full compliment of infotainment and connectivity, including an excellent nav system, Bluetooth everything, a power moonroof, and all that, and it all worked perfectly and proved easy to program and use. 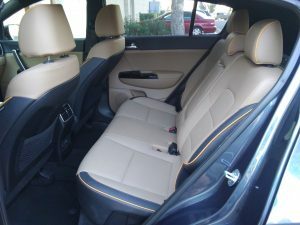 I am particularly taken with the seating, which in this case is a multi toned, and contrasting stitched and piped leather that would look fine in many higher priced rides. The seats not only looked and felt lux, but were also heated and cooled and superbly comfy. 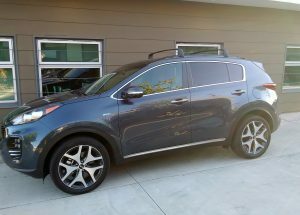 Very upscale — see those days of cheap and cheerful are long gone for the Sportage. Outstanding turbo four is a strong little guy, perfect for this vehicle. Don’t lament the lack of V-6 offerings — just not needed here. 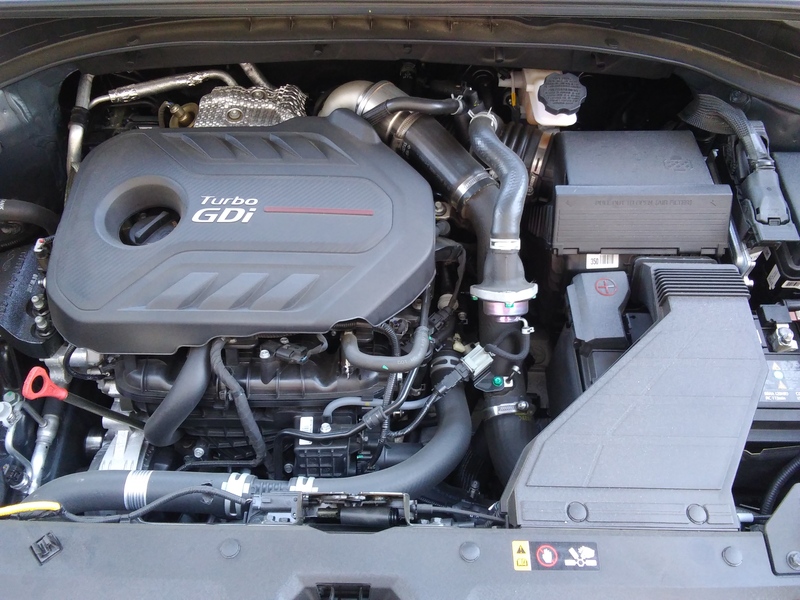 For all kinds of technical and engineering reasons I won’t bore you with here, a 2.0-liter four cylinder engine is a sweet spot of thermal and volumetric efficiency and when you bolt on a turbo and high pressure direct fuel-injection, they can also make great power. The horsepower rating is more than adequate, but what really moves the meter and the car is the great wave of torque this little guy spools out — that being 260 pounds-feet of it. 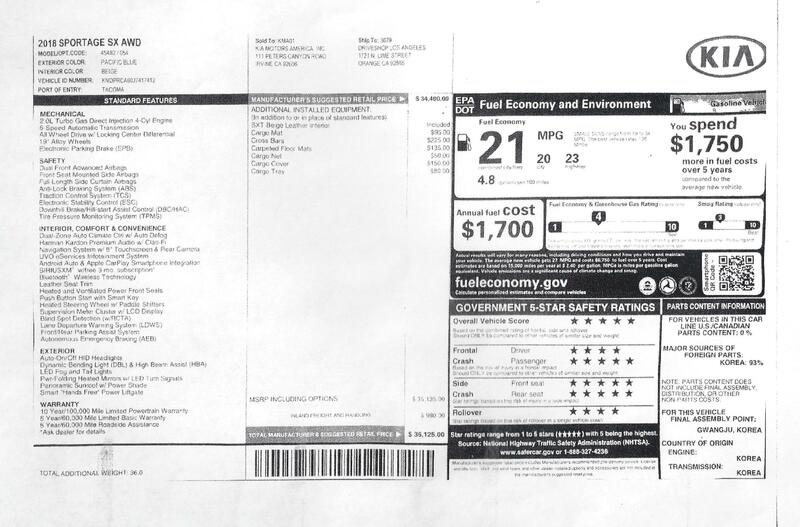 My old 5.0-Liter Mustang LX V-8 made only 40 lbs-ft more (at 300) and that was considered a pretty fast car. 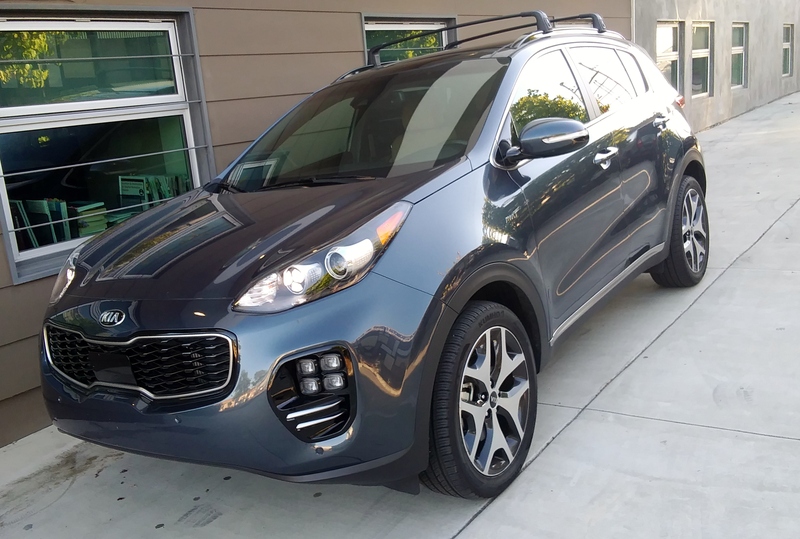 No matter, this engine moves the Sportage very smartly with no meaningful turbo lag — in other words, boot the pedal and this thing goes. 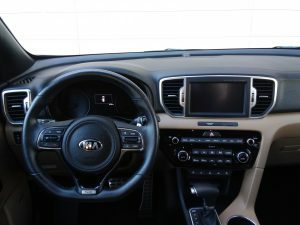 The 6-speed automatic trans is a perfect dance partner for it, with a ratio for every occasion, and crisp well time shifts right where and when you want them up or down, plus you can take manual control of it via the console shifter or the little paddle flippers on the steering wheel. 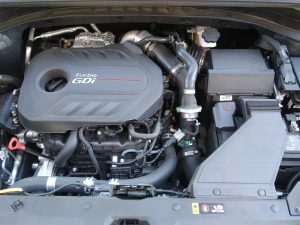 No V-6 engine is offered in this model, nor is it needed, although other model levels can be had with a naturally aspirated I-4 that has less power, better mileage ratings, and costs less. 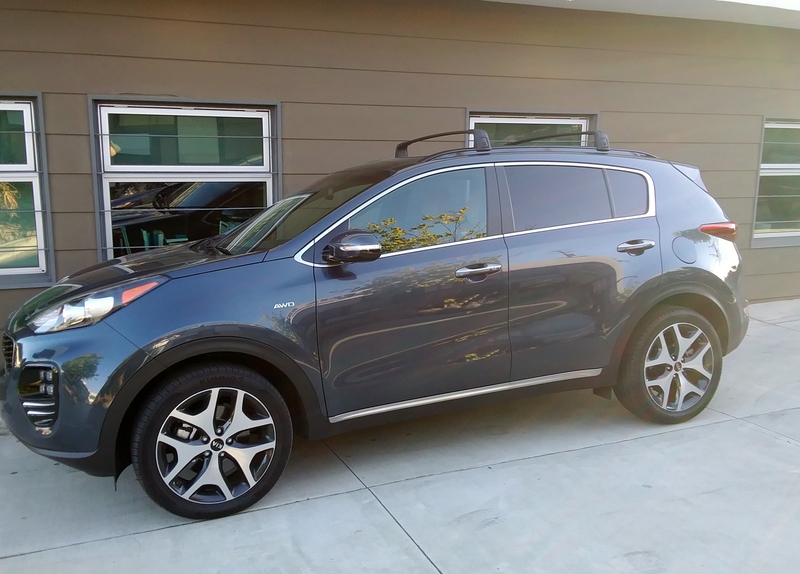 This Sportage has more than enough handling to keep up with the stout powertrain; the steering is very responsive, and body motions are well controlled. It handles well, goes where you point it and rides nice too. It’s also respectably quiet inside, with relatively low levels of wind noise and road rumble. I have no complaints dynamically with this machine at all. I didn’t have the chance to drive it off road or in poor weather, so I can’t speak to its attributes in those conditions, but I have little reason to suspect it’s not capable on dirt roads, rainy days, or heading up to your ski chalet for the weekend. My only issue with (at least this particular unit) is that it struck me as pricey. Granted my tester was the top of the range model, loaded with near every option possible, including all the electrotoys and the baby Bentley two-tone leather cabin. And of course you can spend less than this money for less ritzy or powerful Sportage models, and considered feature by feature, this SX AWD turbo had the content to justify it being fully loaded, but somewhere in my head, $35K struck me as a lot, although there’s not many more offerings in the marketplace I can think of that serve up more for any less. I’m guessing you might get an equally equipped VW Tiguan (espcially since VW is still metaphorically apologizing for its DieselGate emissions test cheating scandal, with a big warranty program and great incentive packaging right now) for less, or maybe certain Escapes or whatever. 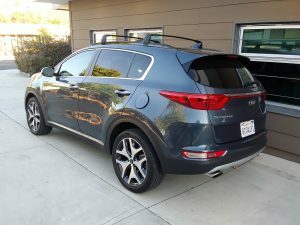 Anyway, I’m not trying to steer you away from the Sportage at all, as I really like it, but caution you to keep an eye on trim levels and options, as you can get to bigger bucks somewhat quickly. And lets not forget the Sportage’s four and five star safety ratings, and best on market warranty coverage. No matter, this is a great car, and if it fits your needs and appeals to you, you’ll like it a lot if the price/value equation works for you too.